The Taizé Community is responding to a joint invitation from Church leaders, Archbishop Thabo Makgoba of the Anglican Church, Bishop Stephen Brislin, Catholic Archbishop of Cape Town, Methodist Bishop Siwa, President of the Council of Churches of South Africa, Revd Dr. Gustav Claasen from the Dutch Reformed Church ... Several brothers of the community have been living in Cape Town since February 2018 to journey with the local communities and to prepare for this meeting. 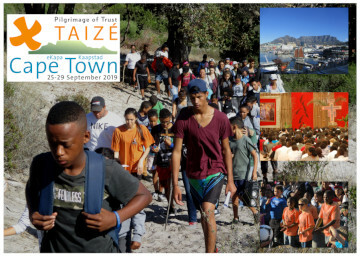 The participants in the Cape Town meeting will be welcomed in the parishes and local communities. The youth will be accommodated by families with simple means. This personal contact will be an important part of this pilgrimage. Everyday a shuttle bus service (and/or train) will bring the youth from the local parish to the common venue at midday for the programme and take them back after the prayer in the evening. Coming to this meeting in Cape Town involves a full participation in the programme and to prepare oneself in advance. Dates: Arrival, welcome and first common prayer on Wednesday 25 September in the morning, departure on Sunday 29 September in the afternoon. Age: for those 18 to 35. Accommodation and breakfast will be in host families. Simple meals will be served at midday and in the evening at the common venue. Transport will be organized from each host parish to the common venue. Reflect along with others on the following themes: Making ourselves more available to others, to God and in the Church and also on the 2018 letter Inexhaustible Joy.